Thermoforming has close similarities with Vacuum Forming except that greater use is made of air pressure and plug assisted forming of the softened sheet. The process is invariably automated and faster cycle times are achieved than in the Vacuum Forming process. Only thermoplastics sheet can be processed by this method. 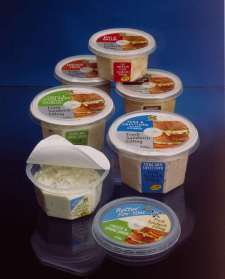 The modern food supply chain uses many forms of thermoformed articles. 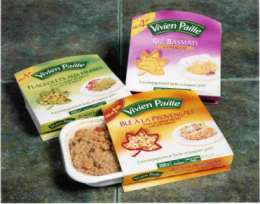 Meat Trays, Microwave & Deep Freeze Containers, Ice Cream and Margarine Tubs, Delicatessen Tubs, Snack Tubs, Bakery and Patisserie packaging, Sandwich Packs and Vending Drink Cups are just a few of the food related applications.Other non-food applications include Manufacturing Collation trays, Blister packaging and Point of Sale display trays. The majority of thermoforming production is by Roll Fed machines. Sheet Fed machines are used for the smaller volume applications. Larger production units have in house sheet extrusion equipment. Because of the complexities in synchronising sheet extrusion equipment and the thermoforming machines, the two processes can be carried out independently of each other. The extruded sheet being produced in advance of production schedules. With very large volumes a fully integrated in-line, closed loop system can be justified. The line is fed with plastics raw material, with extruders feed directly into the thermoforming machine. The plastic sheet is softened at the heating station. It then indexes to the forming station where the mould tools are located. The forming of the sheet is by a combination of air pressure and male core plugs. Certain designs of thermoforming tool facilitate the cropping of the article being formed within the thermoforming tool. Greater accuracy of cut can be achieved by this method due to the article being produced, and the skeletal (scrap), not having to be re-positioned. Alternatives are where the formed sheet, including skeletal, are indexed to the cropping station. The high volumes of articles being produced demand that a parts stacker is integrated into the forming machine. Once stacked the finished articles are now packed into boxes for transportation to the end customer. The separated skeletal is either wound onto a mandrill, for subsequent chopping, or passes through a chopping machine which is in line with the thermoforming machine. Many thermoplastics can be thermoformed, they include Polystyrene, Polypropylene, Apet, Cpet, and PVC. EVOH is commonly incorporated into a co-extrusion for its superior barrier properties in food. Co-extrusions of these materials are commonly used to provide precise properties for specific applications. 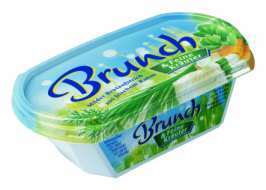 The demands of the food packaging industry are for materials which resist the passage of odours, moisture and gases, hence the use of plastics with superior barrier properties. For non-demanding applications, a mono material sheet is usually specified. This is a sheet in which there is only one material. With a more demanding application, a multi-layer sheet is used. Multi head extruders feed into the extrusion die with the differing materials. Multi layer sheeting, with a heat compliant top layer, can used to make heat-sealed applications. PVC / PE for Meat Trays, and CPET / APET for Meat Trays and Ready Meals. Many of the food related applications demand attractive point of sale product identification and decoration. This can be achieved by either the use of pre-printed sheet or post moulding printing. In the former, multi-colour pre-printed sheet is located relative to the mould cavities before forming. In the latter, the formed articles are printed on a separate printing machine. The limitations of product shape, restricts the extent and ability to print. Dependant on the article being made, round or square, there is always an amount of skeletal (scrap). This can vary from 15 – 50% of the original sheet. Practically all this skeletal is reused in subsequent applications. The chopped skeletal can be re-introduced back into certain sheet configurations by extruding it as part of a new sheet extrusion. Any scrap not used in this way is sold to companies making products such as Fencing Posts and Garden Furniture.